Smoke Tree (Cotinus Coggygria): growing, planting, caring. The smoke tree is called in French the "wig tree" - now you just have to imagine an enormous pink or purple wig on top of a shrub ! The smoke tree, particularly C. coggygria, is a popular garden shrub or a small tree native to the warm temperate northern hemisphere. The leaves are deciduous, alternate, simple oval shape, 3–13 cm long. The flowers are clustered in a large open terminal panicles 15–30 cm long with a fluffy grayish-buff appearance resembling a cloud of smoke over the plant, from which the english name derives. Cultivation is best in dry, infertile soils, which keeps the growth habit more compact and also improves the autumn colour - when planted in fertile soil, they become large, coarse and also tend to be short-lived, succumbing to verticillium wilt disease. The smoke tree is a small tree or a large shrub with colorful foliage, which can reach 5 meters in all directions. The leaves are first green - more or less dark depending on the cultivars. In autumn they turn yellow, orange or red. They are implanted alternately on the branch, and of elliptical shape more or less wide. During the summer the cotinus forms inflorescences in colored filamentous panicles whose flowers are insignificant. It forms from September small oval fruits. 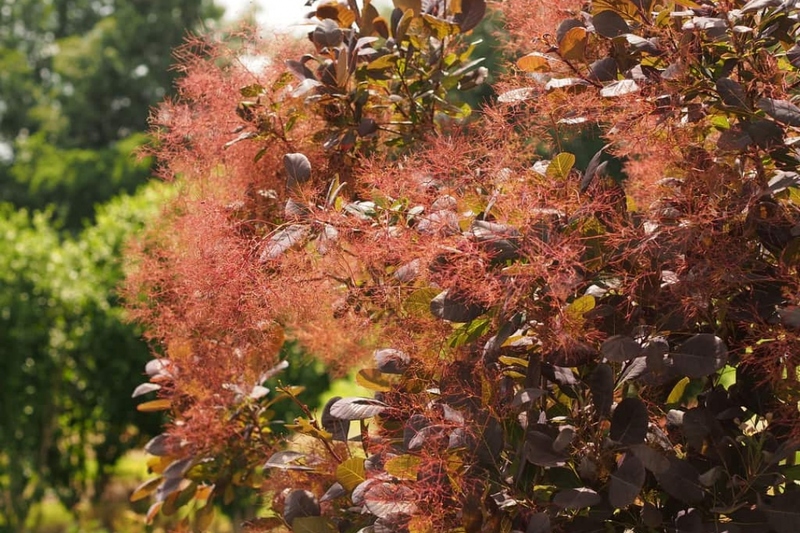 Plant the smoke tree early in the fall to favor rooting before winter, and thus regrowth in the spring - avoid frost in any case - or in the spring for evergreen species. In any case, prefer a drained soil, neutral or acid. The smoke tree enjoys exposure in light sun or partial shade, sheltered from prevailing winds. Be careful not to break the roots and do not bury the root ball too deeply. Plant in a hole at least twice as big as the root ball. Basin roots - soaking them in mud - before planting, it will greatly improve the chances of recovery, regardless of the conditioning. You can form a hollow around the plant, it will serve you for watering during the first months. Tamp the soil well around the roots (do not hesitate to use all the weight of the body). Water copiously until filling the watering bowl. Water the first few weeks every three days if you have planted late. For the watering of shrubs, it is better to carry out important watering, but infrequent, to force the root system to fetch water in depth. Water "until satiety", that is to say until the planting basin is filled, and only empties very slowly. The cotinus has a beautiful natural shape! It is therefore important to preserve it by avoiding unbalancing the foliage. As a result, no pruning is theoretically indispensable. If you still want to reduce, balance or reshape the antler, for example if only a small volume is available, you can prune it in early spring. Note: the author of this sheet has already found the formation of "witches brooms" - a multitude of branches starting from the same point - very unsightly after the pruning of cotinus. It is therefore inadvised to shorten large branches.